If you follow me on Twitter, you've already heard me screaming about how much I love this book for the last 10 days. If not, get prepared, because I have a lot of gushing to do. It's pitched as STRANGER THINGS meets THE RAVEN BOYS. I didn't know that going in, but it explains why I love it so much. 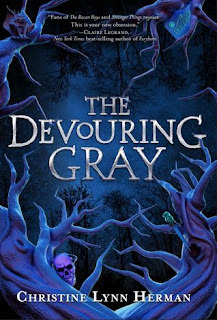 THE DEVOURING GRAY is set in Four Paths, a town occupying the same space as a sinister otherworldy forest called the Gray (STRANGER THINGS fans will get Upside-down vibes!). It's also where the four founding families imprisoned a dangerous Beast. Now only those families, with their strange supernatural powers, stand between the people of Four Paths and a grisly death. Enter our main characters. Each is from a founding family, and each is struggling with something horrific. But as founders, their only choices are to pretend nothing is happening, or band together and hope their misfit crew can find the truth about Four Paths, before the Gray overtakes them all. The characters are honestly the crux of this book. Without them, you'd have an exciting, suspenseful supernatural tale, but with them, it's so much more. Poignant. Devastating. Emotionally gutting. In a town where everyone knows everyone, being a founder can be both blessing and curse. When they love you, you're a god. When they hate you, you're invisible, or worse. With the Gray killing more and more people, the town is looking to the founders--for answers. For retribution. It's no wonder that all the members of the four families are kind of messed up. For each character, Christine does such an excellent job of weaving the bigger stakes in with more personal problems. You can't help but be drawn in to their angst. Our four MCs all feel broken in some way. They're all struggling with personal failings, family drama, and messy friendships born of constant misunderstandings and lack of communication. Violet is new to town, struggling with her grief over her sister's death and her mother's coldness. And also the fact that she's suddenly a powerful, magical figure in a town she'd never heard of, and other founders are fighting to manipulate her into joining their side. Harper lost half of her arm when she failed her ritual, but what she misses most is her friend. Justin stopped hanging out with her, and she's been invisible to the town ever since. All she wants is to prove herself worthy, and to get revenge. We don't get Isaac's POV sadly, but we see him through others: an angry, volatile boy, abandoned by his family, and known by some as the lapdog of the Hawthornes (Justin's family). Justin himself is the golden boy--but no one realizes that he failed his ritual. I connected with him a lot, because I know that other readers won't like him. Because he's messy without having an easy loss to empathize with: a death, an injury. His turmoil is all internal. Feelings of inadequacy, failure, and guilt. He spent his life under his mother's thumb, and when she told him to stay away from Harper, he followed along. But now that his mother treats him like an embarassment and wants to send him away from town forever, he's realizing that she doesn't necessarily have his best interests in mind. I just think his journey is so relatable for many of us who have made real mistakes, hurt people without meaning to, and are now struggling to be better people in the fallout. I was in a strange position where I cared about them all, but I was also very angry at them a lot of the time for being so cruel to each other. It's the mark of great character writing when I get invested enough to cry over a book. And it wasn't even the larger plot, but the destroyed friendships that did it. Our four MCs spend a lot of this book digging into each other and tearing each other apart, and it's not all fixed in the end. There are no easy reconciliations. In fact, some things get worse and more broken, and it's not necessarily anyone's fault. It's just so damn real. Also like half the characters are bisexual and it's just seen as a totally normal things, which is amazing. The character dynamics could be a book in themselves, but they're even more poignant occuring in the context of a life-or-death supernatural showdown. The Gray is killing more people. The four founding families have been fractured, and only the Hawthornes and Carlisles really remain in strength, except they hate each other and their schism is threatening to break apart the whole town. Everyone is keeping secrets, even our narrators, even from you as the reader. As Violet and her gang delve into the town's history, they find that the truth of the Gray and the founders' powers isn't so simple. And that not everyone wants the Gray closed. It's a twisty book where you're always on unstable footing, and every reveal is more shocking and gratifying than the last. All of this is packaged in Christine's sharp prose and sense of the macabre. 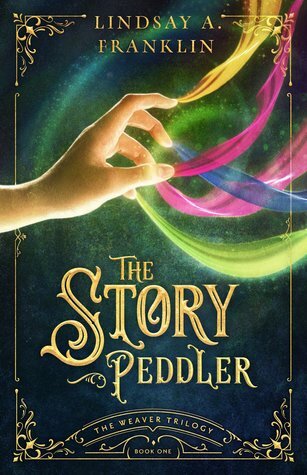 It's difficult to pin down exactly how, but she fills each page with an atmosphere that is eerie and macabre, and a little fae. Like reading an old Grimm's fairy tale made new. There are definitely fairy tale elements, like the town founding myths. The Deck of Omens, a tarot deck that can see the future. The founders' symbols--daggers, stones, branches, bones--that represent their magical powers. Moving statues. Paranormal rites. Undead cats. It gives me THE HAZEL WOOD vibes in the best way. But with a style that is uniquely Christine's. I've gone on longer than I meant to, because I have so much to say about this book. It's a rare story where both plot and characters are fully realized, but Christine has done it. I raced through my read, and I definitely need to read again because there is so much complexity there to be appreciated. If you love the supernatural, you need this book. If you love well-drawn, complex character relationships, covering the whole gamut from friendship to familial to romantic, you need this book. Note: I received this copy from the publisher for an honest review. The price of the book and its origin in no way affected my stated opinions.